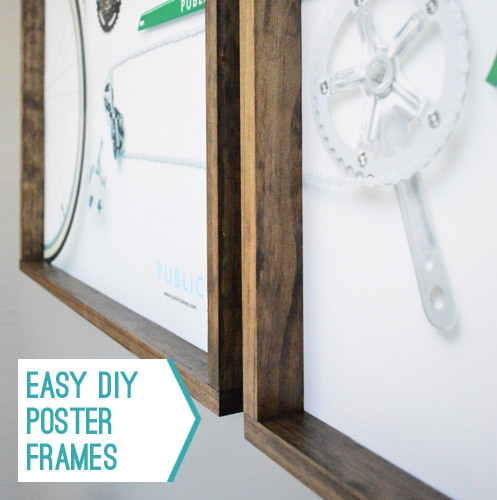 Do you remember the DIY picture frame that I posted a while back?? It was basically a piece of MDF, cut to size and painted, inspired by this post from Bower Power. Well, after I did the faux shiplap treatment to the wall in our family room, I knew that I would have to make some adjustments to our family photo frame. This is how it looked after I painted the wall. I pondered how to fix this for a few weeks. I went to Micheal’s and Joann’s to price custom framing, which was around $150 for a mat, a frame, and no glass. I actually thought about doing that until I saw this post from Young House Love. They made these wooden frames for some large posters, and even though I was dealing with a MDF and not a poster, I figured I could adapt it a bit. This was the pic from their post that inspired me. So here’s my made up, slightly jerry-rigged process for how to make a DIY, mounted, framed, picture frame, ha! I went and picked up 2 boards of 6-foot, 1″ x 2″ pine from Home Depot. I originally had them cut it to my specs, but it was off by a 1/4″. They do allow a 1/4″ variance in their cuts, but since I needed this to be precise, I went back and they allowed me to return the cut boards for 2 more 6-foot pine boards. Once I got home I decided to muster up the courage to use our miter saw. I have never used this before and I was pretty intimidated, but I wanted this project to be done, so I found a YouTube video on how to use it and cut myself 4 pieces to fit my exact specifications. Yay!!! Once I made my four cuts (2 boards, 21″ long and 2 boards, 31 inches long) I sanded and stained the boards. And because I didn’t want to mess it up using nails or screws (I figured I got lucky with making perfects cuts, couldn’t mess up now), I used wood glue and glued the boards to the MDF frame. And for extra good measure, held them in place with hand weights and a bottle of juice! (that’s the jerry-rigging part, lol). I also painted the outer edges of the MDF with a bright white paint to bring more contrast against the shiplap wall, which is painted Alabaster from Sherwin Williams. Those “tabs” are velcro Command Strips that I used to adhere the picture to the MDF board. I only let it dry for 2 hours before I hung it up. The bottle said to wait 24 hours, but I was getting too antsy! I feel like breathing a sigh of relief that I was actually able to pull this off. I’m so glad that I mustered up the courage to use the saw. Ladies, you can do this kind of stuff! I am definitely going to start using it more…maybe some board and batten?? Haha! I might need a little more practice first, but I’m really proud of how this turned out! Fabulous outcome. I’ll have to get you a tool belt for Christmas!! !